caption 9:52h. 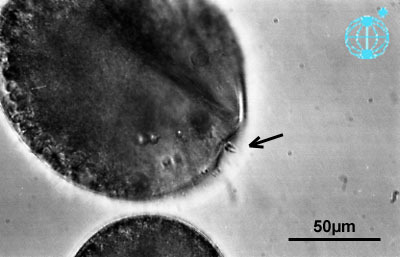 Detached Gyrodinium undulans of egg of Pseudocalanus elongatus (culture). Arrow marks the point where Gyrodinium undulans was attached before. For further development see also: observation 745 (15-March-1997) and observation 749 (17-March-1997). This image is part of the collection of Dr. Gerhard Drebes.